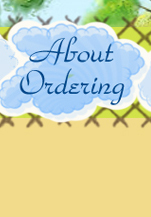 The following items are available for purchase and can be shipped immediately. You can mouse over the photo to zoom in for better detail. 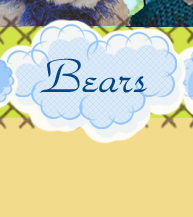 If you would like to order a custom bear or friend please visit the Archive Page to see the possibilities. 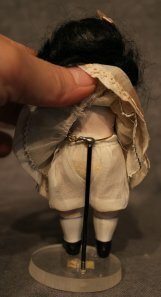 This little girl is an all bisque doll and with jointed arms and legs. She is 3 inches tall and really cute but I don't know when she was made. Judging by the style of the dress, bows in hair, shoes and socks she is likely from the 1800's on up. I also don't know what country she might be from but probably Germany or France since they did the most all bisque dolls. She does not have any cracks but you can see there are some painting flaws on her head. She has great detail on her body from the mold. 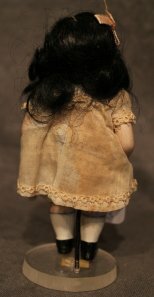 This Doll has been sold, Thank you! 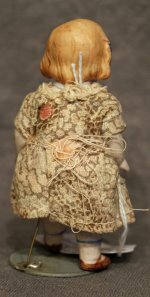 1910 ~ 5 1/4" all Bisque jointed child girl doll. 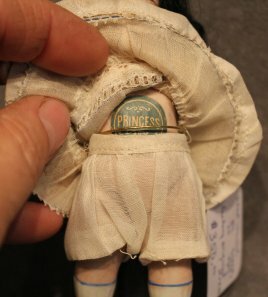 There is a paper label on her belly that reads "Princess". Her head is incised 83, 25. Her head is in great condition with beautiful detailing. 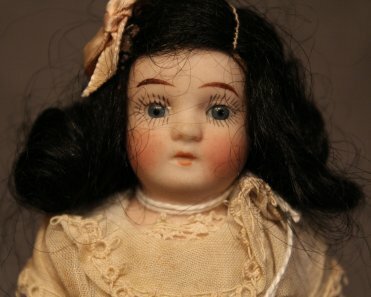 Rosy cheeks, painted lips, painted eyebrows, large painted eyelashes and blue glass sleep eyes. Even the little red dots in the corners of the eyes and in the nostrils. Very finely crafted! Her black wig feels like hair to me but I'm not an expert so can't be sure. The wig is parted on the side with a nice peach satin bow. Her hair is a little wild so would look better with some proper care. Her eyes are sleep eyes and open and close with no problems. Her body is also of bisque and jointed at all arms and legs. Her joints are not loose and in good condtion. She has painted white socks with a blue line around the top of the sock. She has black painted shoes. Her hands and arms are in great condition with no cracks or chips. Her legs and shoes are also in great condition. Her dress is factory original of woven linen with tiny trim. The dress does show some staining, with a heavier stain in the back, and general wear typical for her age. She is wearing matching linen bloomers which are in great shape and are clean and unstained. These items are collectibles and not intended for children.